I have an exciting new guest bedroom update today! 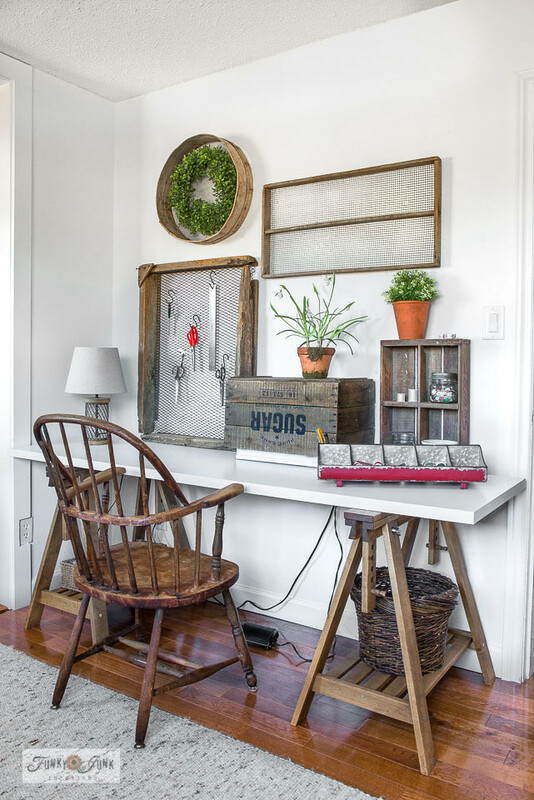 For months, I knew this Ikea trestle sewing table and desk would be a part of this guest bedroom. And it’s finally happened! Which gave brand new purpose to this room. For those new to this project, I’ve been working on what use to be my son’s room turned guest bedroom, turning it into also a sewing area that doesn’t always look like a sewing area. I desired this room to be simply a beautiful guest bedroom then full out sewing when the desire hit. This post also contains some affiliate links below. I’ve been enjoying the challenge so far! And today we move on to the long awaited desk! 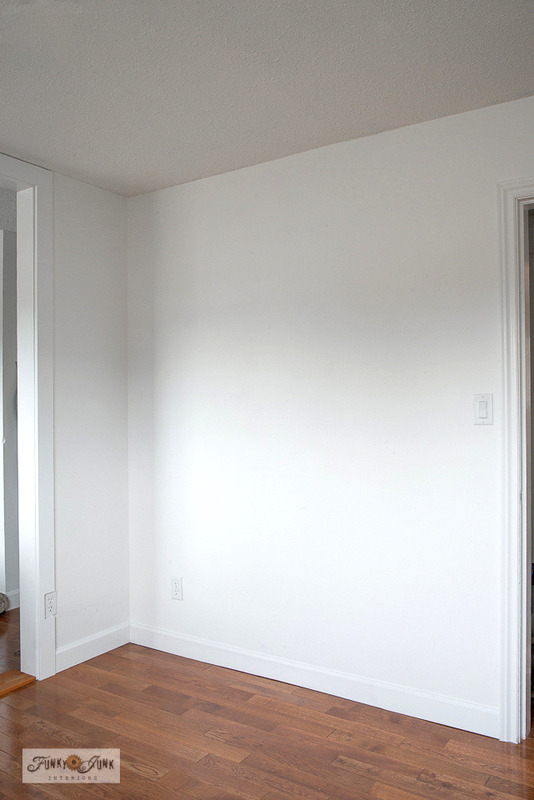 I desired this space to house a piece of furniture that could easily double as a desk or sewing table. 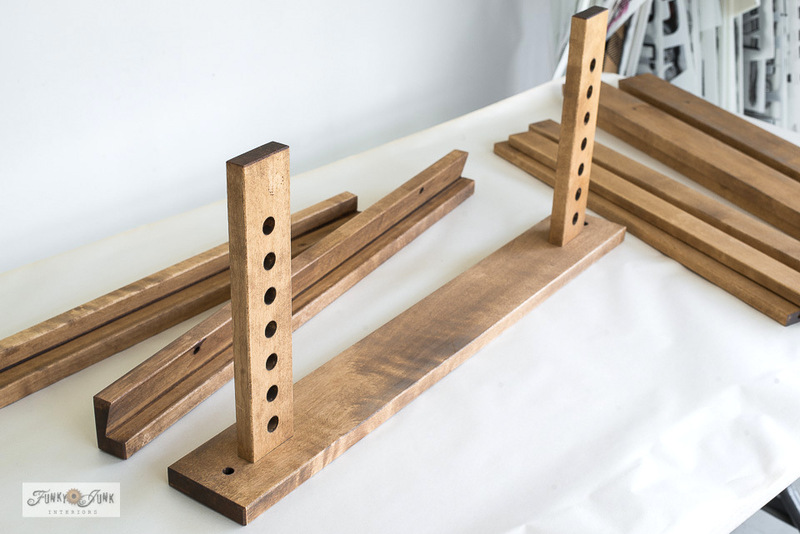 Hoping for an up-cycled look, I choose the Ikea trestle desk components which emulate two sawhorses for legs. 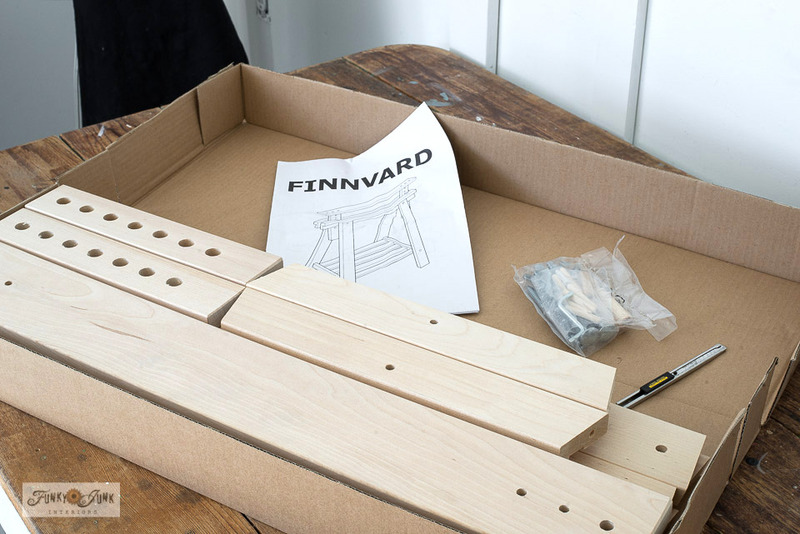 Ikea has a range of mix and match components so you can customize your own desk. So I chose two Finnvard trestle desk legs in pine so it was easy to stain in order to create a rustic look to match the antique bed and shelving in the room. Once again, I set up a little staining station in my photo studio. I mixed Fusion’s Stain and Finishing Oil in Golden Pine with a little Cappuccino added into a paper plate to mix my desired tone. 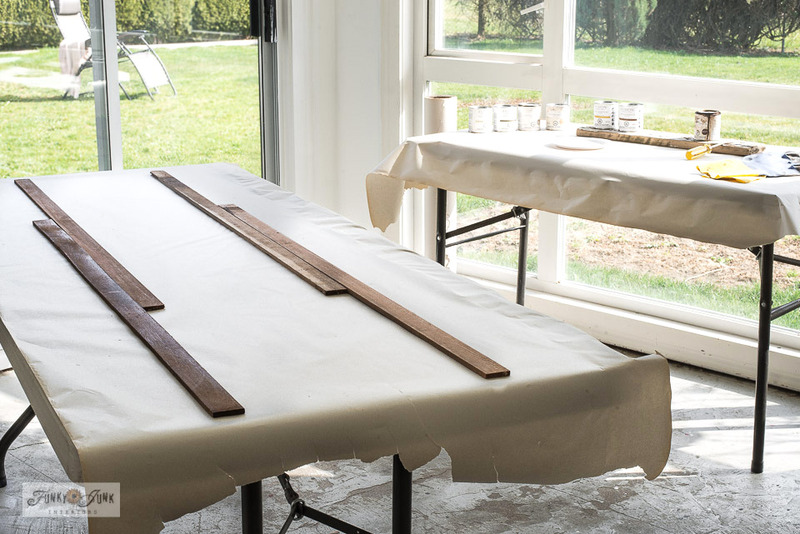 Next, I placed some cedar wood strips across a worktable, so the stained pieces could be elevated off the table, no matter what their size. It worked great! To keep things neat and tidy, I stained on the mixing table, then brought the pieces to the drying table after they were wiped. 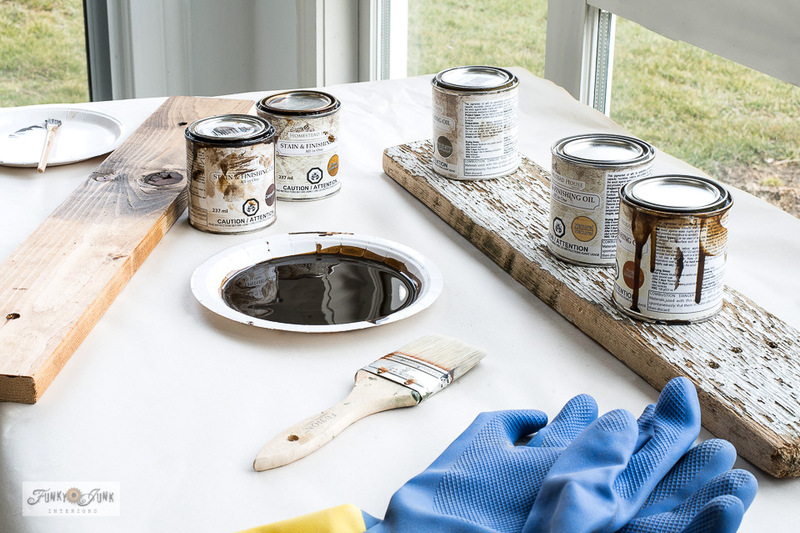 Ensure your wood pieces are clean and dust-free. 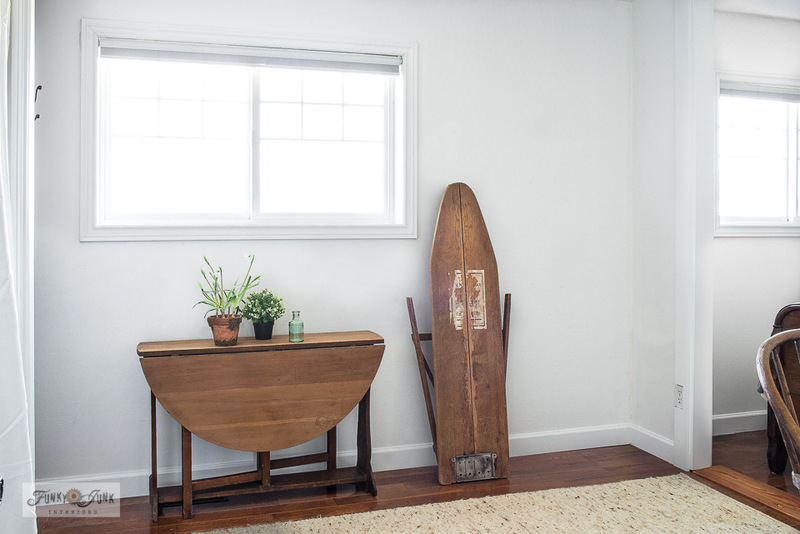 Brush stain onto your chosen substrate, then wait a few minutes and wipe away excess with a soft rag. 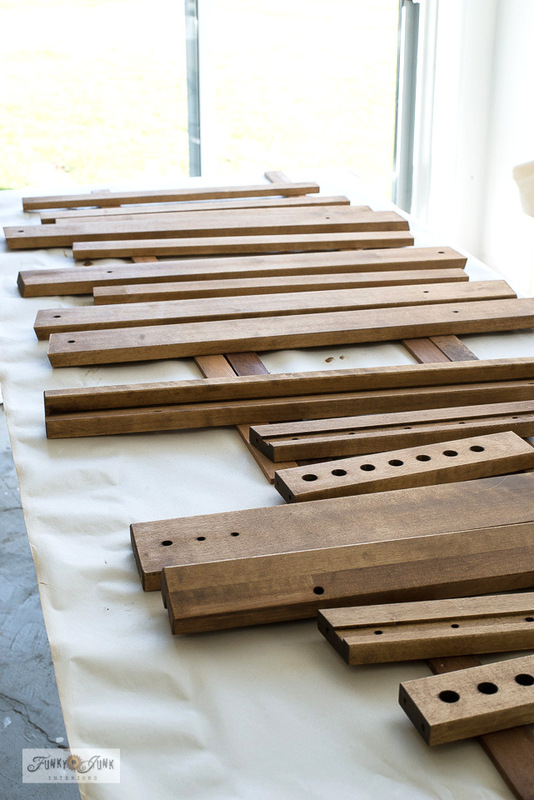 I used a small paint brush to stain inside any holes in the pieces so they all looked finished. What a difference! 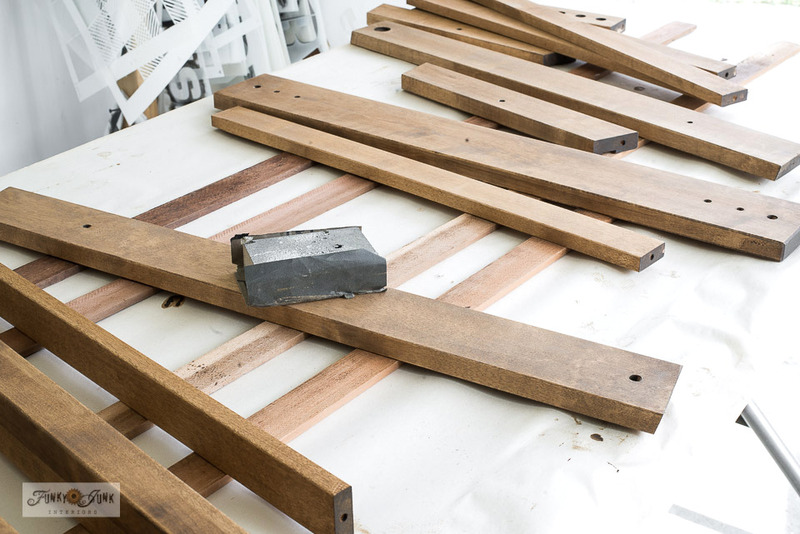 I love the fact that the trestle table legs come as unfinished solid wood, making this a super easy project. After the stain had dried overnight, I sanded each piece leaving a butter-smooth finish. According to my pro woodworking brother, one should never sand with the sandpaper on a block, or palm sander as your last sanding. Wrap a high grit quality sandpaper around a sanding block instead. I have been following this advice and I will admit it really upped my project quality game! Ikea’s directions are exceptionally easy to follow as they are all pictures and no words. The trestle table legs went together in a snap! I swear Ikea designers are puzzle experts because their furniture always fits together perfectly like a well-designed Survivor game challenge! By the time I built the 2nd trestle leg, I didn’t even need the directions. It went together in minutes. These are the little dowels that slipped into predrilled hole as part of the trestle shelves. I love how all the pieces looked so good! It really pays to stain before assembling. You get a much nicer professional finish! What a beauty, huh? 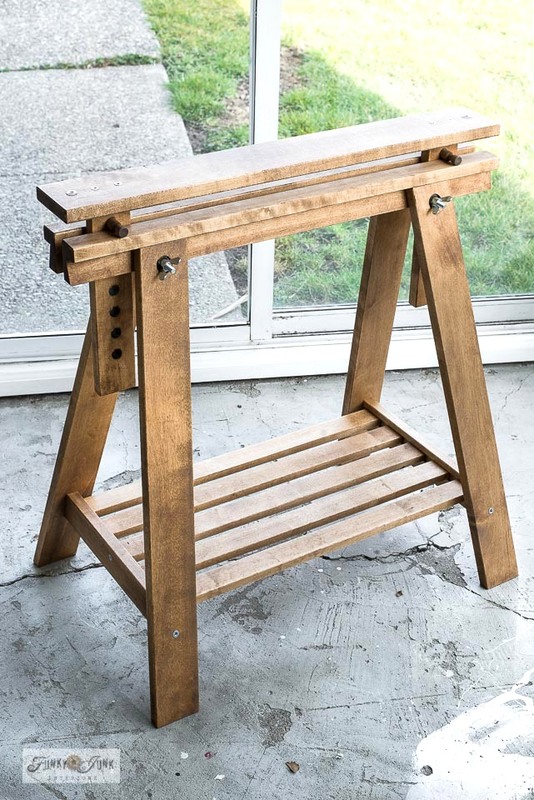 I think it has a home-spun up-cycled sawhorse-look without the headache of building one from scratch, or using a trashed one when you want something a little cleaner or higher end. Duly noted. 🙂 While I will mix in antiques and such, at least I am honouring his request with a style that suits what I wish to look at all the time. Another neat part about these legs is the adjustable top. You can higher the top to counter height, or even angle the top into a leaning-towards-you art table if desired. Kinda cool to have those options. With the two trestle table legs complete, it was time to team it up with the top in the sewing room. The desk top comes in various finishes, colours and sizes. As luck would have it, this top was the perfect dimensions for this wall space! One more inch larger would not have worked. Crazy, right? I also chose a white top to bring more lightness to the space, as well as for exceptional photography purposes when sewing a new project. The top has a little bit of a matte feel to it so it isn’t exactly like a laminate, but pretty close. 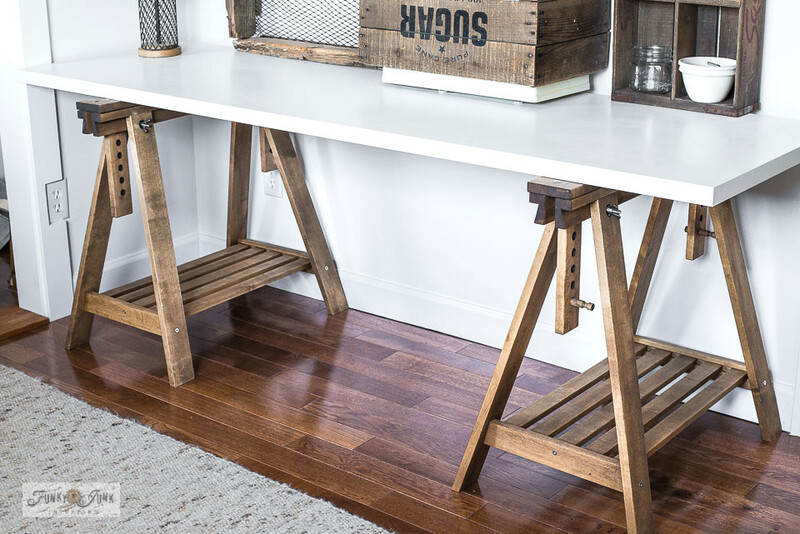 Doesn’t it pop perfectly against those stained trestle legs?! I think the white top and darker stained rustic legs is a beautiful, classic combo that will stand the test of time in ANY room. I also loved the fact that the trestle legs have shelves that are easy access for things to grab. 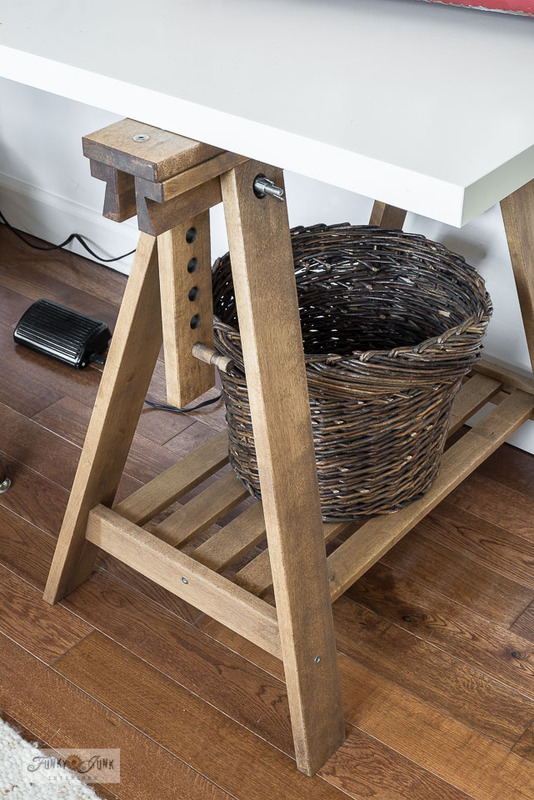 Thus far, I hide the sewing pedal cord inside this basket, creating more of a desk look when a guest stays over. With the table finally in place, it was time to bring up all my old high-school days sewing gear. What a jumbled mess! But I’ll gradually replace old thread with new and pick up a few other things for my needs today. It’s going to be so nice to finally find this kind of gear in a well organized space! I also recently took a super spontaneous trip to Hobby Lobby in the states with my friend Susan. 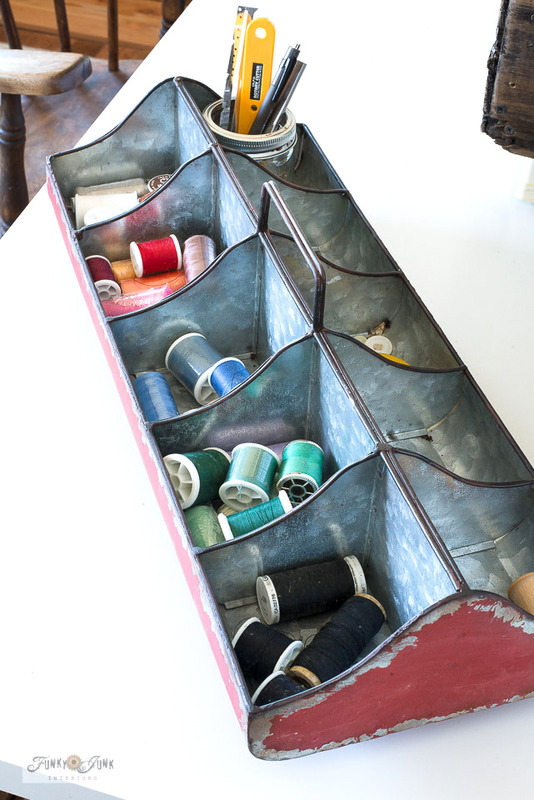 This beautiful antique-looking galvanized organizer is too perfect for organizing sewing thread and so forth! And fits perfectly on a trestle shelf. Cool! Isn’t that antique finish to-die-for? Pretty cool for a reproduction! I got it at 50% off too landing at $15 US! Whoop! 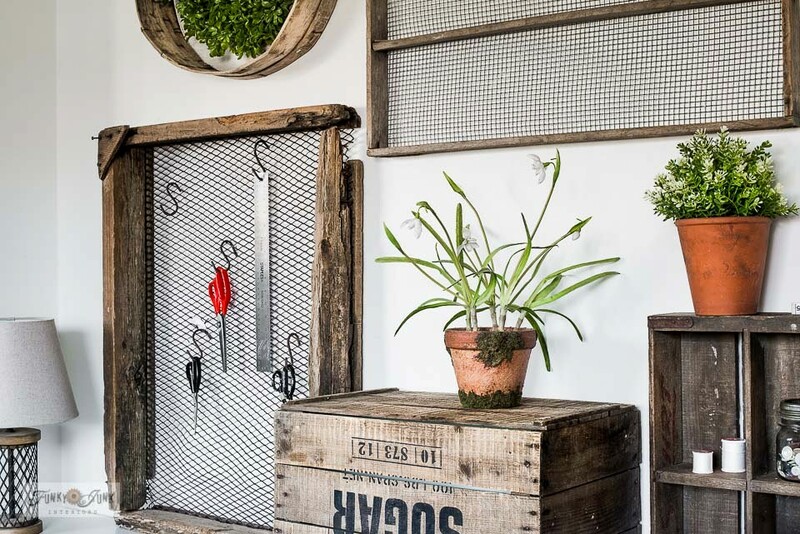 As wall art for the guest room, I visioned this wall showcasing my small collection of antique soil sifters and crates as art and productive organizers for sewing. 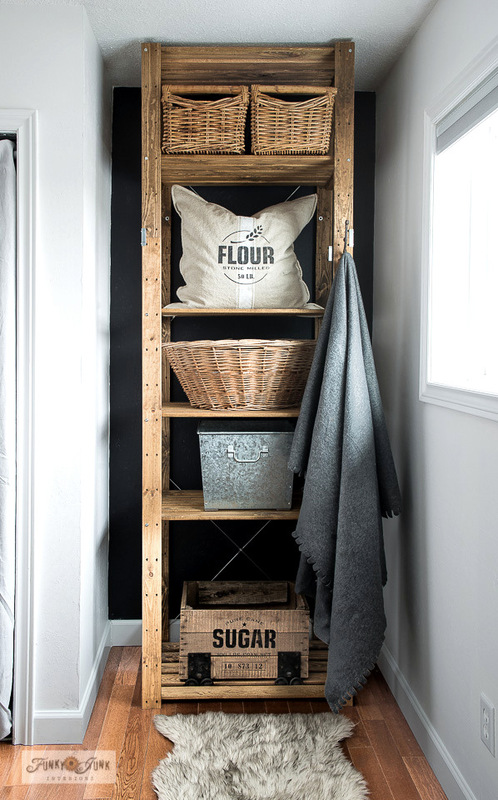 The Sugar crate (originally shown HERE) hides the sewing machine (I have plans to make a larger one), and another crate became an instant mini shelf. 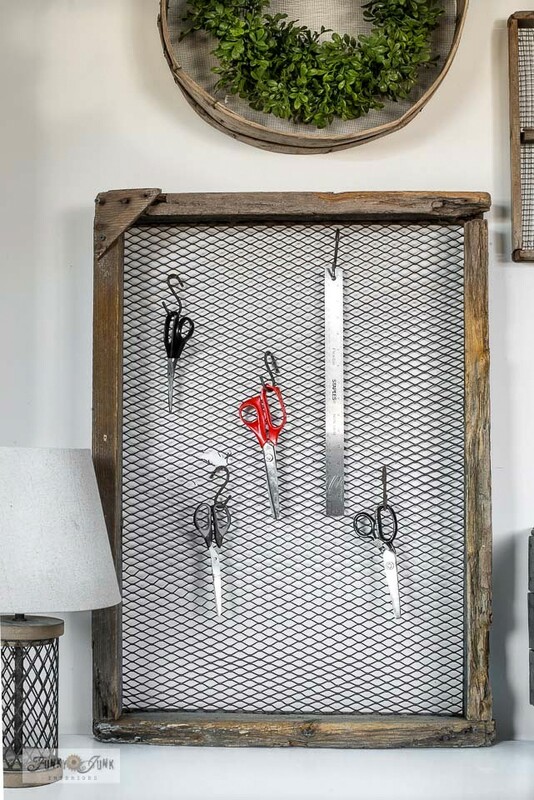 This large wood framed antique soil sifter became the perfect place to hang a few scissors with added S-hooks! The cute little caged wire lamp is from Walmart from a couple years ago. It’s perfect with all this other gear. Is now this sewing area that will double as a guest desk! I also have a different chair I’ll be sharing with you soon too! But for now, this all totally works. Above is a short video of the initial Ikea shopping trip and includes some great staining tips! The other side of the room is also ready! The little antique fold-out table will provide extra sewing surface space, and I’ll eventually ether buy or sew a cover for the antique ironing board. 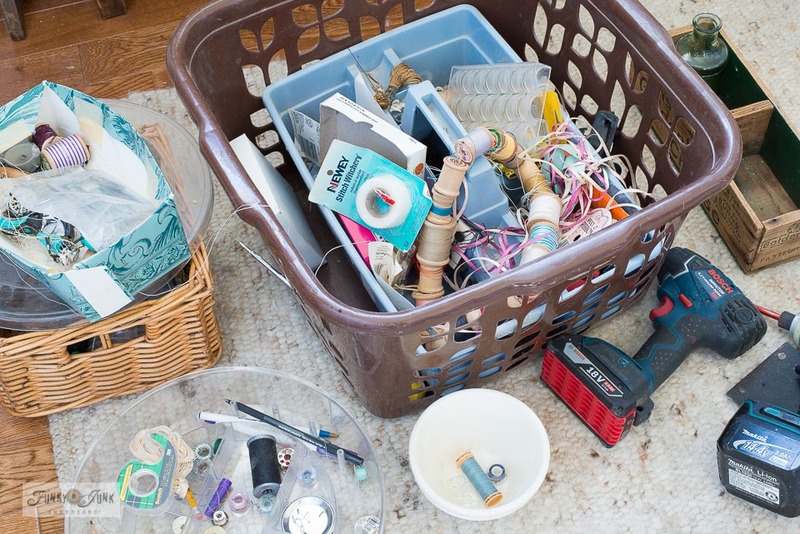 I mean… it IS a sewing room after all… first project perhaps?! And… another new thing to come. A new curb side find which will greatly help with sewing storage will be placed beside the ironing board. Will this project EVER end?! What do you think of the new desk addition? 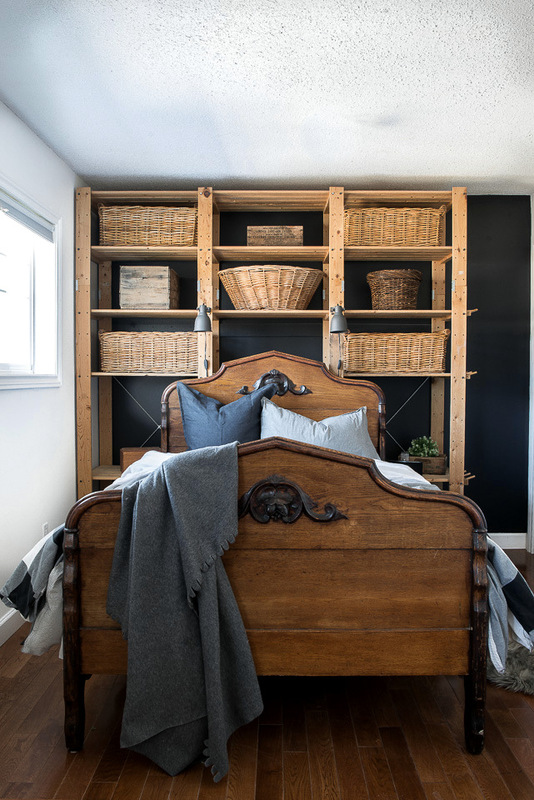 Visit the antique bed that changed the theme of this room! 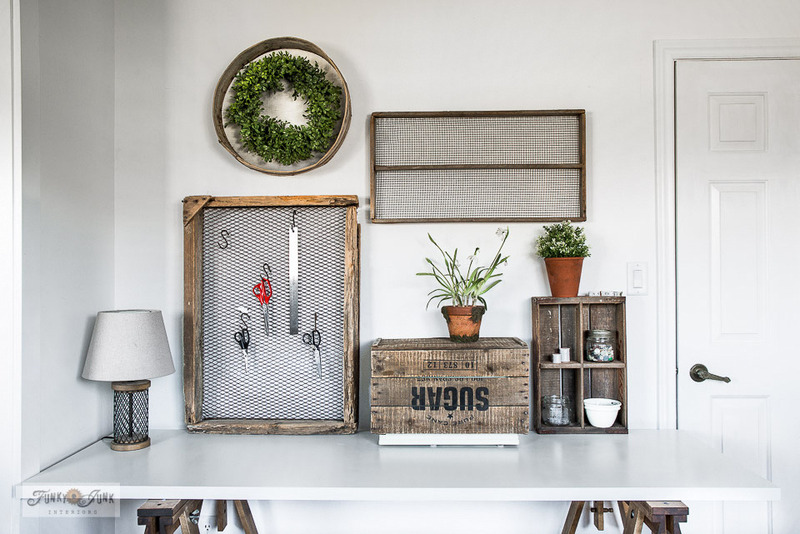 Learn how to make rustic Ikea shelving that extends to the ceiling. Oh wow!! I totally love it! Matter of fact I love the whole room! You sure come up with amazing ideas! Love it! The trestles look great, and I hope it works well for future sewing projects. The room is coming together beautifully. As always, you did an amazing job, it looks GREAT! How very nice. 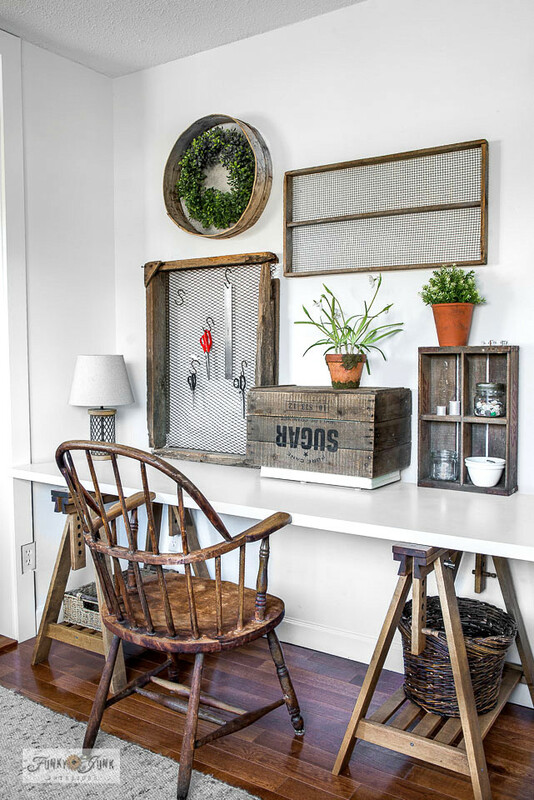 The whole room holds together so well, has an uncluttered vibe, and is just lovely. I know you put a lot of thought into this project and the results show it. So nice. Job well done. Appreciate the kudos! This one has been fun! This room is turning out so nicely! I just love that bed; it is gorgeous. Love the wood, white and black theme you’ve got going. Your guest/sewing room is great. It has turned out awesome. Is your decorating style a little like minimalism? I am drawn to it at times, but at others I desire more. And then it’s necessary to edit. Guess I’m learning. Does that ever happen to you? 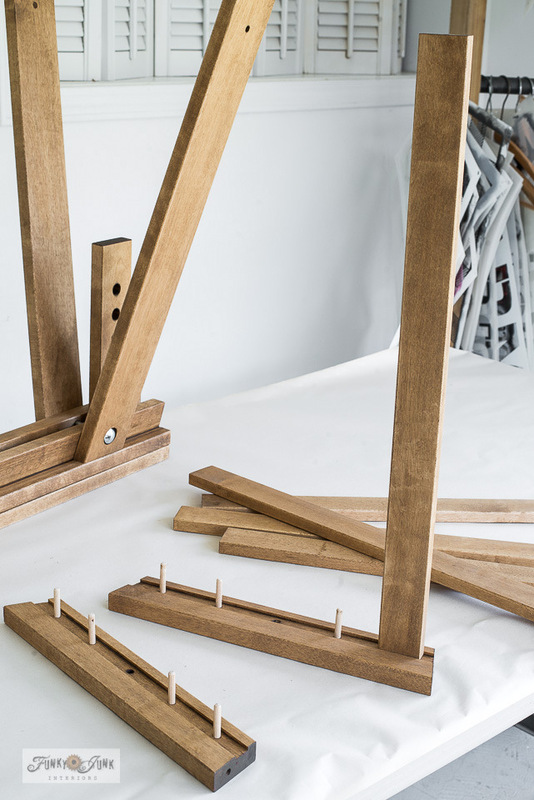 Anyhow, Donna, I really, really like the legs for the sewing table that look like sawhorses. My dad was a carpenter and sawhorses remind me of him. And my sons, boy they would really like it if some of the industrial(that’s what I call it) touches you have could be incorporated more here at home. Thanks for showing us the progress and I eagerly await the rest. Hey Joanne! Yes, I do feel I have turned towards a more minimalist approach when I compare my earlier days of decorating. My goal is to have the spaces look quiet, yet still filled with warmth if that makes sense. I do that warmth effect through reclaimed wood. Instant cozy! You said it best. Decorate, then remove and play around until you are happy. I do this with every single room I decorate! A LOT! To properly refresh a tired room, I gut it except for the main components that will stay (ie sofa or bed), then place stuff back until I’m completely happy. I also take photography into consideration when I decorate which most wouldn’t have to. I tell ya, that extra step really makes you work at it! haha A good thing I think!